Linné on line – Why isolate from plants? Linné on line Linnaeus and Pharmacy Chemistry in nature Why isolate from plants? Many of the biologically active substances in plants have simple chemical structures (e.g., eugenol, hydrochinon, anetol), but there are also chemical substances with very complicated structures (e.g., taxol, vincristine, artemisinin). 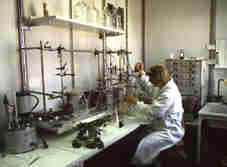 It then becomes a costly procedure to produce the correct substance with the help of organic chemistry because of the many steps often needed in the synthesis process. A large amount of starting material is needed since you often lose a great deal during the course of the work. This is because synthesis methods have limited turn over rates and seldom convert all the original material into the intended product. These reactions are carried out in plants with the help of various enzyme systems that are especially made in order to produce the right substances. This is why the pharmaceutical industry is still, in many cases, dependent on medicinal plants, as starting material, in the manufacture of drugs. Several of the plant substances, which are used medically today, are not economically viable to synthesise. They are too complicated. It is not only that it can be difficult to extract substances out of plant material, it is also that the desired substance often occurs in quantities less than 0.1%. At Uppsala University today, research is being done concerning the isolation of medically active substances from medicinal plants at the Department of Medicinal Chemistry, Division of Pharmacognosy.